With some pre-election planning, R can help you generate on-deadline charts, graphs, and analysis. This goes the same for other expected data you’d like to analyze on a tight time frame, such as new census population data or the latest job-growth report. Planning is critical. Sweden’s Aftonbladet newspaper went all-in with R for its election coverage back in 2014. In a blog post about their experience, Jens Finnäs said a key to successful on-deadline coverage was preparation. They decided to focus on breakdowns by municipality, and collected some data in advance. They also decided what questions they wanted to answer before results started coming in. In what format will election results be available? Knowing this will give you a head start in creating charts and graphs. Will data be in the right shape for you to analyze in your preferred R tools? If not, do you have code ready to get it prepped for analysis? If you’re pulling in national/state-wide election results from a paid service API or compiling results yourself from staff reports in the field, you may know the format in advance. If results come from a local official, maybe the format is similar each year; or you can ask in advance for a sample spreadsheet. What would you like to do with this data? Create a searchable, sortable chart? Graphs? Maps? For election data, do you want to examine how demographics affect candidate preferences? Show which communities changed party preferences over time? Look at turnout versus demographics or results? Using results from a prior year or test data, you can set up code ahead of time to do many of these things and then swap in updated results. This chapter’s project shows how I might have prepared to cover the 2018 Massachusetts gubernatorial race. I’ll use 2014 data to visualize results and create an interactive table. I’ll then have steps that will be fairly easy to adapt for upcoming contests. When cooking a meal, things work out better if you have all the necessary tools and ingredients at the start, ready on the counter as you go through your steps. It’s the same with an R “recipe” – I like to set up my data variables at the outset, making sure I’ve got “ingredients” at hand. For my recipes, I start by creating variables with data files at the top, making it easier to re-use with other, similar data (as well as move my work from one computer to another). Also at the top, I load all packages I want in memory. Where’s your data? I suggest giving some thought to how you want to store your data files. I spent a few years creating one R project for each election I analyzed, ending up with data and geospatial files scattered all over my computer’s hard drive. That made it unnecessarily aggravating to find geospatial files that I wanted to reuse, or pull together past election results over several years. Later, I made one folder in my Documents directory for geofiles and another for election data, each with subdirectories for national, state, and local files. Files I’d like to use on both my desktop and laptop are in a Dropbox folder that syncs on both systems. This may not work for you. You might want to create one R project for mapping files and another for election data. When you get more advanced (beyond what I’ll cover in this book), one of the best things you can do is create your own R package. However you decide to organize your data, it’s helpful to keep to a scheme so you know where your data and scripts are if you want to use them again. Get the data. Data from past Massachusetts gubernatorial elections are available from the Secretary of State’s office with results by county, municipality, and precinct. I downloaded the data and included them as Excel files in this book’s GitHub repo. I’m pretty sure I’ll want to use these again someday. I can save the information and R structure using base R’s save() function. save(ma_cities, file = "path/to/geofiles/MA/mamap2015.Rda") saves the ma_cities object to a file in a project subdirectory called mamap2015.Rda. Multiple objects can be stored in a single file using the syntax save(variable1, variable2, variable3, file = "path/to/myfile.Rda"). You can also use the longer .Rdata file extension instead of .Rda if you’d like. When you want to use an .Rda (or .Rdata) data object again that you created with the save() function, run load("path/to/geofiles/MA/mamap2015.Rda") (or wherever you saved it). Any R objects stored in mamap2015.Rda will be loaded into your working session, using the variable names you used to store them. There are a couple of other things you might want to set up as variables in this configuration section if you’re serious about re-use. Adding information such as chart and map headlines and source information makes it easier to re-use the script in a future year with new data from the same sources. ma_gov_headline <- "Massachusetts 2014 Governor's Results"
ma_gov_datasource <- "Source: Massachusetts Secretary of State's office"
Reminder: Using four or more pound signs after each section header lets me use navigation at the bottom of the script panel, as I explained in Chapter 6. I imported both 2010 and 2014 voting results into R using the variables that hold the file name and location: ma_gov_latest_available_file_name and ma_gov_previous_available_file_name. When I’ve got the latest 2018 results, I can swap that file into my ma_gov_latest_available_file_name variable at the top of the script, and I won’t have to worry about remembering to change it anywhere else. The %>% operator is availabe for use whenever you load the dplyr package. The %<>% operator isn’t. To use %<>%, you need to explicitly load the magrittr package with library(magrittr). This syntax may make for less readable code, especially when you’re first starting out. However, it also makes for less typing – and that means less possibility for errors, especially if you have multiple objects with similar names. Decide which syntax works best for you for the project at hand. I’ll start checking the imported data with str(ma_latest_election), head(ma_latest_election), tail(ma_latest_election), and summary(ma_latest_election) (or glimpse(ma_latest_election) or skimr::skim(ma_latest_election) ). I’ll just work with the 2014 data in this section to save space; the 2010 data would be similar. When I ran str(), head(), and tail(), I saw a few issues. There are 352 rows instead of 351, and – from tail() as you can see in Figure 12.1 – the last row is a total row that I don’t want for the map (that explains why there are 352 rows when I should only have results for 351 cities and towns). Most importantly, though, all the results columns came in as character strings instead of numbers. Figure 12.1: Viewing the last few rows of election data with tail(). This is one of the few cases where Excel is “smarter” than an R package. Open up the CSV in Excel, and it understands that “25,384” is a number. R, however, expects numbers to only have digits and decimal places. Once it sees a comma, it will “assume” a string unless there’s some code to tell it otherwise. The total row is easy to get rid of. I could remove row 352 with ma_latest_election <- ma_latest_election[-352,] using bracket notation or slice(ma_latest_election, -352) with dplyr. Or, as in the last chapter, I could slice off the final row using dplyr’s n() function and the minus sign: ma_latest_election <- slice(ma_latest_election, -n()). But to make a general recipe, I could also filter out any row that starts with “total”, “Total”, or “TOTAL”. I’m not sure whether a total row will have “total”, “Total”, or “TOTAL”. But I don’t have to worry about that if I explicitly tell R to ignore case. The stringr package’s str_detect() function comes in handy here, with the syntax str_detect("mystring", "mypattern") when using case-sensitive matching and str_detect("mystring", regex("mypattern", ignore_case = TRUE)) to ignore case. I’m also using the %<>% operator here. tolower() here doesn’t permanently change the column to all lower case, but transforms it only for the purpose of checking for string matching. ! before str_detect signifies “doesn’t match”. Next: It looks like there’s no data in columns X2 and X3. You can check to make sure by running unique(ma_latest_election$X2)) and unique(ma_latest_election$X3)) to view all the unique items in that column, or table() on each column to see a table of all available data. For deleting more than one column, dplyr’s select() might be a better choice: ma_latest_election <- select(ma_latest_election, -X2, -X3). The minus sign before column names means they should be removed instead of selected. Even better, though, would be a function that deletes all columns that have nothing in them. There’s a function in the janitor package that does this: remove_empty(). As you might have guessed, remove_empty(ma_latest_election, which = "rows") would remove all empty rows. R-friendly column names. To get ready for my main analysis, I’ll rename the columns to make them R friendly (getting rid of slashes and spaces) as well as chart friendly. If I’m re-using this script in future elections, I’ll need to make sure to replace this with new candidate names. One strategy is to put the column names in the configuration area at the top of the file. Another is to mark every area that needs updating with a comment such as #### NEEDS REPLACING ####. The previous section got the data ready for analysis in R. This section will do a few simple calculations to make it easy to see who won and by how much. These are things I need to do with every spreadsheet of election results, unless that spreadsheet already includes columns for winners, vote percentages, and margins of victories. Instead of re-writing that code each time I analyze election data, I created a couple of functions in an R election utilitiess package that I can re-use. With those ready-to-use functions for processing election data, I find election calculations in R even easier than doing them in Excel. I wrote these functions years ago, before creation of packages like purrr. The code is old, and could probably be rewritten more efficiently, but it works. You are welcome to use those functions, too, if you’d find them helpful, which are in my rmiscutils package. Calculating a winner per row. It’s a multi-step operation in R to look across each row, find the largest vote total, get the name of the column with the largest number, and make sure to account for ties before determining who won in each row. The rmiscutils package’s elec_find_winner() function does this for you. elec_find_winner() takes these arguments: 1) name of a file as a character string (in quotation marks) because it assumes you’re using the package to read in a CSV or Excel file, although "mydata" without a .csv or .xlsx extension will assume you want to use an already-existing data frame and convert the character string into an R data frame object for you; 2) the number of the column where candidate vote totals start; 3) the number of the column where candidate vote totals end; and 4) whether you want to export the results to a CSV file. This function calculates a winner for each row, as long as the data is formatted as the function expects: each candidate’s vote total is in its own column, and each place (city, precinct, state, etc.) is in its row. And, it returns both candidates’ names if there’s a tie. By specifying columns 2:5, I excluded write-ins, blanks, and the Total column when calculating the winner. The function creates a new Winner column. Percents can also better show at a glance how polarized an outcome was. A race can be close overall and close in most communities, or it can be close overall but with many communities voting heavily for one side or the other. Looking at a map or chart showing only which candidate won misses a key part of the story: Winning by 1 point isn’t the same as winning by 12. In Massachusetts, Boston has the largest number of votes of any community by far, and Democrats almost always win there. But for Democrat Martha Coakley in 2014, winning Boston handily didn’t give her an overall victory – she didn’t run up her overall vote total enough to offset Republican Charlie Baker’s strength elsewhere. Comparing results with prior elections would be helpful here to understand what happened. One possibility is that she won Boston by a slimmer percent margin than Democratic Gov. Deval Patrick did before her. Another possibility is that she won Boston by similar margins as Patrick did, but turnout was lower in the city than in prior years. Yet another possibility is that all was the same in Boston as when Patrick won, but pro-Baker areas had higher turnout. However, one step at a time. Let’s first get 2014 data in shape for some basic analysis. elec_pcts_by_row() can calculate Baker’s percent and Coakley’s percent versus the overall Total in each row. The syntax is elec_pcts_by_row(mydata, c("candidate1", "candidate2"), "TotalColumn") (the total column name expects the total column to be named “Total” so it won’t be necessary to define it here.) Note I’m also using magrittr’s %<>% so I don’t have to keep writing out winners <- winners %>% , but if that’s less understandable for you, feel free to keep using “wordier” syntax. I’m not interested in the third-party candidates, write-ins, blanks, or the lower-case place column right now, so I’ll remove columns 4 through 8 for streamlined analysis. Figure 12.2: A summary of the winners data frame. Next, there are some other dataviz “basics” I’d like to run on election data to find out who had the largest vote margins and percent victory margins, and where it was closest. There are two different types of visualizing you’re probably going to want to do if you’re covering an election. Exploratory visualizations will help you better understand the data and decide what stories you want to tell with it. These don’t have to be pretty or well labeled; they just need to help you see patterns. Presentation visualizations are for your audience, and so need to be constructed with a bit more care. 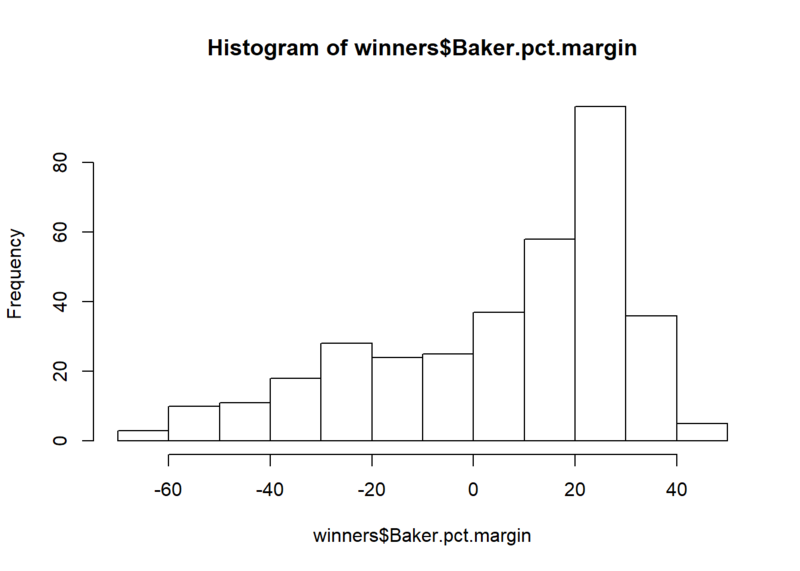 Figure 12.3: A histogram of Baker’s winning percent margins. You can see in Figure 12.3 that Baker had a few big losses/Coakley had a few big wins, but the most common results had Baker winning by between 10 and 30 percentage points. 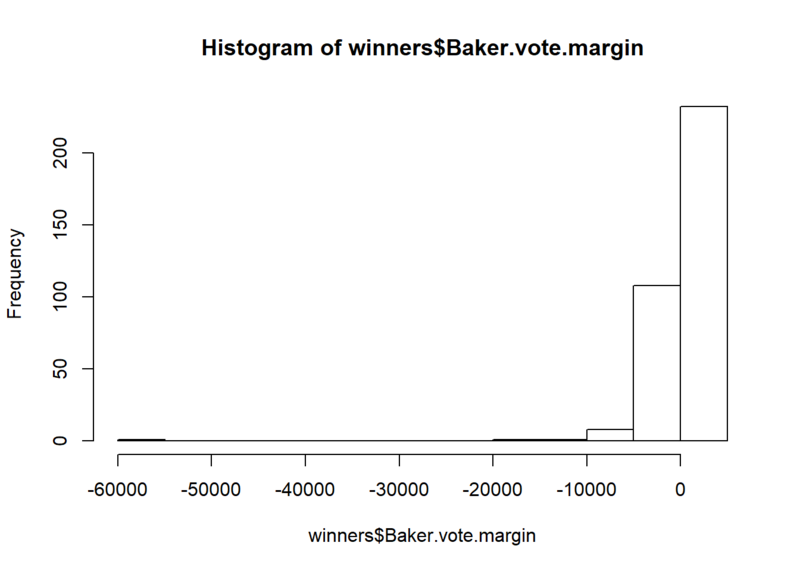 Figure 12.4: A histogram of Baker’s winning vote totals. It looks in Figure 12.4 like Baker won a lot communities by small vote totals – either because large communities were close or he won in a lot of small towns. Later in this chapter, we’ll take a look at that. The way these election results are structured, Baker’s largest margins are positive numbers and Coakley’s largest margins are negative numbers, because I calculated data for the winning candidate, Charlie Baker. However, I’m also curious to see the largest margins regardless of who won. For this case, then, I want the absolute values of Baker’s vote margins, turning everything into a positive number. Otherwise, if I pull “largest vote margins,” I’ll only get Baker’s top margins and won’t see Coakley’s top raw-vote wins. Coakley, the loser, had the five largest raw-vote wins, including winning the state’s largest city by a very healthy margin. There are more of these types of highest and lowest results that would be interesting to see, but it starts getting tedious to write out each one. It feels a lot easier to do this by clicking and sorting a spreadsheet than writing out code for each little exploration. If you’d like to re-create that in R, you can view the winners data frame by clicking on it in the Environment tab at the top right, or running View(winners) in the console. Clicking on a column header once sorts by that column in ascending order; clicking a second time sorts the data frame by that column in descending order. This is a nice if unstructured way to view the data. Figure 12.5: A sortable, searchable table created with the DT package. You’ll get an HTML table that’s sortable and searchable (see Figure 12.5). The table first appears in RStudio’s viewer; but you can click the “Show in new window” icon (to the right of the broom icon) and the table loads in your default browser. datatable(mydf, options = list(pageLength = 25)) sets the table default to showing 25 rows at a time instead of 10.
datatable(mydf, options = list(dom = 't')) shows just the sortable table without filters, search box, or menu for additional pages of results – useful for a table with just a few rows where a search box and dropdown menu might look silly. (If I have more than one numerical column, it’s easy enough to replace one column number with several.) All my DT snippets start my_DT_ so they’re easy to find in an RStudio dropdown list if I start typing my_DT. If you run that, you should see a MA2014_results_table.html file in your project’s working directory. As with maps in the previous chapter, you can open this file in your browser just like any local HTML file. You can also upload it to a Web server to display directly or iframe on your website – useful for posting election results online. That table also makes interactive data exploration easier. I can filter for just Baker’s wins or Coakley’s wins, sort with a click, use the numerical filters’ sliders to choose small or large places, and more.